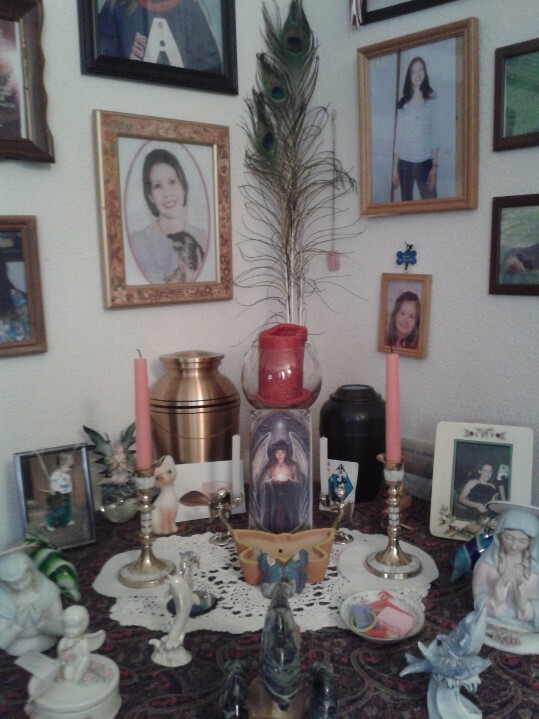 I was in my own little world while I carefully placed the pictures above my daughter’s memorial altar. I usually clean and rearrange things about once a week. I put up new pictures and just give it a good once over. If there is something new I will find a place for it and take off the old things, it just makes me feel better. Even after 6 years of doing this every day, it never gets old. But today was a little different. For some reason I kept getting this nagging feeling that somebody was tapping on my shoulder. Every time that I started thinking about something that had to do with Sarah and remembering things that we did, my thoughts would get interrupted so that I would hear, ” Do it again. I’m just like you.” I kind of ignored it for a while, thinking it was just some crazy thought that I was having that made no sense. But then I started listening to it, and decided to pay attention. What did it mean and who was saying it? What had I just done that I needed to do again? Who was just like me? Then I got smart, what was I doing at this very moment, taking care of Sarah’s alter! What had I just done? I had just gone through reading about my Human Design! I immediately froze. Every emotion you can possibly feel… I think I felt all at the same time. I was whirling in space not knowing which direction to go and wanting to go everywhere at the same time. I didn’t know if I should laugh or cry or run and tell someone, and who was there to tell that would even have a clue as to what just happened? My knees were getting weak I had to sit down. I grabbed the closest thing to me so I wouldn’t fall, and I sat. And as I sat there trying to hold all of these emotions down I decided to call the one person who I knew would understand, my dear friend, coach and fairy godmother, Maia Berens. I picked up the phone, shaking inside, and hands trembling, full of emotions I struggled to contain. I dialed her number. When she answered she immediately thought there was something wrong. I told her everything was ok and just spilled it all out not giving her a chance to even catch her breath. I told her all I needed to do was verbally express my excitement and surprise to somebody that I knew would understand. When she finally realized that I was okay and that there wasn’t anything seriously wrong, she told me how surprised she was too, but she also had company and couldn’t really talk. I told her that was fine. I was just so excited and had to tell someone right away but that I would talk with her at a later time it. I then thanked her for listening and hung up. Ching, the Tarot, and other spiritual beliefs of both Western and Eastern traditions. I could see different pieces of truth in all of them and how they fit in my life, but I never had a defining moment in my life where I really knew who I was. Not until I was introduced by my fairy godmother, Maia Berens, to Human Design. It was like a light bulb went off and I was awoken for the first time to an enormous shift in understanding and awareness of who I was truly meant to be. I am still learning about this multifaceted system which has unlocked an inner code with in myself I have never found in any other studies. A code that I can apply in how I make decisions and the understanding of why I think and feel the way I do. It has also enabled me to better understand the designs of others, (my children in particular). I can see why they behave the way they do and have the attitudes that they have. This is what I was so excited about when I discovered that my daughter Sarah, who passed away six years ago, was also the same design type that I am. A Reflector. Our type represents 1% of the world’s population. We are unique and special. Which I have felt my entire life. And I know started to we are the rarest of the types. Our design type is constantly reflecting back to others who they are what they are about and what life is about. We constantly are absorbing the qualities and energies of the other Human Design types. We are affected by the designs of others who are around us. Because of this we are very empathic. We experience all the passion fears, thoughts, emotions and ambitions that are transferred onto us. We are extremely sensitive, vulnerable perceptive and potentially wise. We have an innate objectivity which allows us to witness the energies passing through us and what they all mean to everyone. This gift is like a mirror where people see themselves in us. It can also be quite frustrating and we have the feeling that no one really sees us for who we are. We become lost in everyone else’s “stuff”. And find it difficult sometimes to know where to draw the boundaries. We can be caught up in others chaos and negativity and become very overwhelmed. When others are depressed we can take it on as our own, not realizing that we have nothing to be depressed about. Needless to say we desire solitude and a lot of it at times just so that we can reflect on ourselves. This was something I saw in Sarah. She was all of this and more. She was wise beyond her years and had such a good heart. She was such a wonderful human being. She had no enemies in the world and was a friend to everyone. She could be around a lot of people then all of a sudden sneak off to her room and want to be alone. I now understand why. I used to always say that Sarah had a message for those of us that she left behind. I always felt she had tried to be here several times before and that she came to save her older siblings and teach them lessons. I still believe that and I have a much clearer understanding now that I know she is a Reflector. Isn’t it ironic that Reflector stands for “Clear Vision”?